Follywood Productions presents a Summer Tribute on Saturday, June 13th at The Windjammer on Isle of Palms. 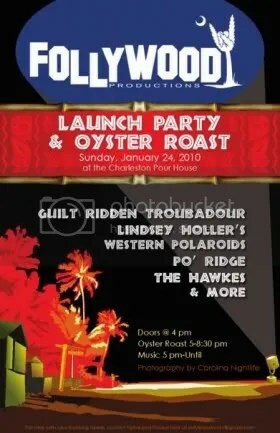 The music line up for the evening features Guilt Ridden Troubadour, 54 Bicycles & BYOG. Doors for the event ooen at 8pm with the show starting at 9pm. Tickets are $10 ADV / $12 DOS and are available for purchase here. Guilt Ridden Troubadour stands on the songwriting of Reid Stone to cohesively achieve a psychedelic roots rock sound. GRT’s sound is lyrically-driven alt-country and Americana with the Southern rock edge. 54 Bicycles is comprised of several dedicated Widespread Panic fans and friends who bring the music of their favorite band to the local Charleston music scene and to have a great time in the process. In addition to playing select Widespread tunes, they also play a number of cover songs by artists from JJ Cale to Pink Floyd and everything in between. BYOG is a 5-piece jam driven vehicle. Their original material is crafted with instinctive groove, while they tend to stick close to their roots, covering artists like The Band, The Allman Brothers Band, and The Grateful Dead. For more information, visit www.the-windjammer.com/wp/event/follywood-summer-tribute.